North Norfolk is renowned for its varied countryside and wildlife, ranging from wetlands and rolling hills to beach and marshland. For 28 year old Ed Bramham Jones, enjoying the spoils of nature is the best thing about living in the area. “I’ve lived in North Norfolk for nearly all my life and everyday remind myself how lucky I am. I love walking and wildlife watching throughout the area as there are so many diverse landscapes to explore and species to see. In particular, I love to walk along the River Wensum because it’s such a tranquil setting. The whole of North Norfolk is an amazing place for migratory wildlife, which can be seen at some of the many RSPB and conservation sites. 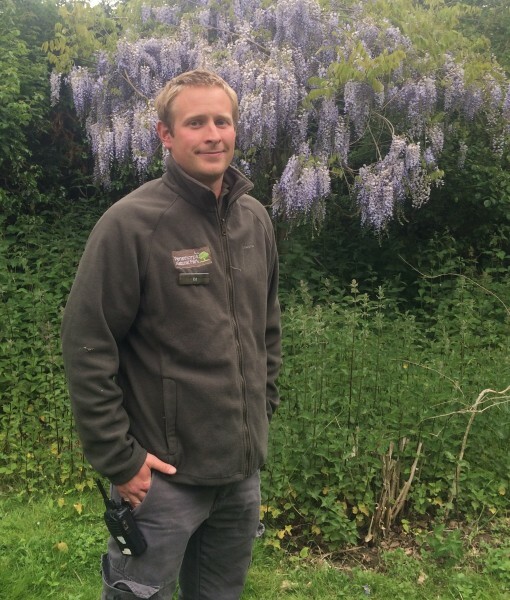 Ed works as a Reserve Manager at Pensthorpe Natural Park, a wildlife and nature Conservation Park set in the heart of the North Norfolk countryside. “I’ve been at Pensthorpe for 12 years in total. As Reserve manager, it’s true to say that my job is very varied! It can be anything from managing habitats in the Reserve to helping on our Conservation Grade Farm with our heard of English Longhorn Cattle or interacting with visitors at our daily bird feeds. “Conservation is at the heart of everything we do at Pensthorpe. Preserving and restoring our diverse countryside is vital to ensure it can continue to support the myriad of plant and animal species that make up our biodiverse natural landscape. Alongside the work we do to ‘Actively Save Species’, we do a huge amount of habitat management and restoration, wetland recreation and management of wildflower meadows. We’ve also created wild bird strips and hedgerows for farmland birds and mammals on our wildlife-friendly farm. More recently, we’ve restored a 3km stretch of the River Wensum in a £680,000 grant-funded river restoration project to put one of the country’s most important rivers back into sound ecological working order. This project has also seen the creation of Wensum Wetlands, four large new reedbeds and wet woodland, which is due to open in autumn 2016. Penthsorpe is home to a large variety of wildlife, with birds and insects being the most common sights. Ed said, “The Pensthorpe Estate provides the perfect natural environment for animals which is rewarded by a huge array of waterfowl and waders such as Little Ring Plover, Avocet and Lapwing. It’s also a great place to see birds such as Bittern, Crane and birds of prey. In the summer months, it’s brilliant for butterflies and dragonflies, with over 20 species of dragonfly and 25 species of butterfly seen in the last few years. 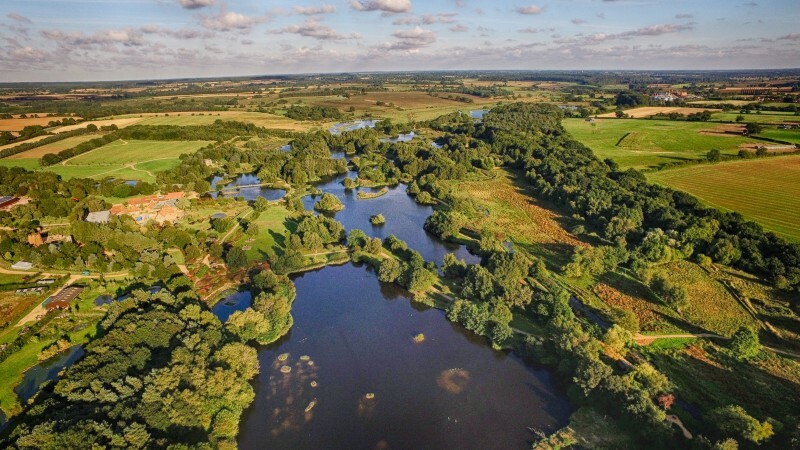 “Pensthorpe Conservation Trust (PCT) is a charitable Trust based at the park to showcase to visitors the importance of species and habitat conservation. The PCT works alongside partner organisations in national conservation programmes to conserve and reintroduce key species. These partnerships include Operation Turtle Dove, the Great Crane Project, a Red Squirrel breed and release programme as well as a Corncrake Re-introduction project. For animal lovers and those who want to actively help the wildlife, animal adoption schemes are available to buy. Ed thinks they’d make great gift ideas too! If you want to see some behind the scenes areas of Pensthorpe, Ed recommends The Pensthrope Explorer. “It’s a commentated vehicle tour which takes visitors to areas of the Pensthorpe Estate which are normally inaccessible by foot. From the comfort of a Land Rover and trailer, visitors can unearth the history of Pensthorpe and exciting treasures such as medieval hand axes and Woolly Mammoth teeth and tusks. These artifacts were all found on the site when over two million tonnes of aggregate was removed to make way for the Park we see today. 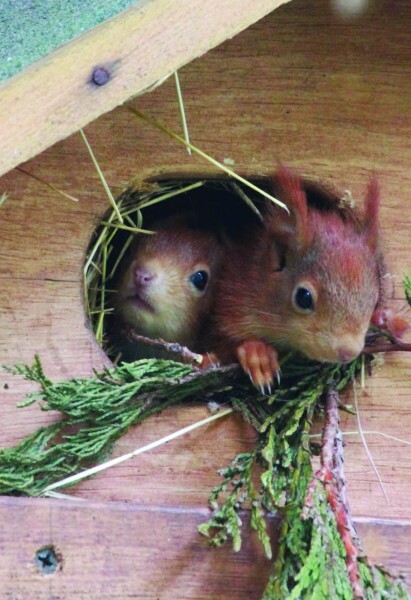 “If you want a more personal experience of the wildlife, you can join the wardens to meet the owl, hedgehog and red squirrels! Pensthorpe makes for a great day out for all the family, with plenty of child friendly activities to keep little ones occupied. “Pensthorpe is a fascinating outside classroom! Families can hand feed the geese, discover larger than life bugs on the bug walk, unearth stamp stations, build their own den and see how camouflage works in the natural world on the mirror trail. The park is made up of 660 acres of lakes, woodland and wetland habitats, with the River Wensum running through its heart. Ed in particular loves the beautiful gardens. “There are four stunning nature-inspired gardens which provide year-round colour and interest. The Millennium Garden was designed by international garden designer Piet Oudolf on an area formerly part of a gravel digging site. Similarly, the Wave Garden is built on an old railway line and provides stunning spring colour as well as food and shelter for birds and wildlife. My favourite garden has to be the Millennium Garden because it’s fantastic for wildlife and looks magnificent when it reaches its late August peak! The site is also home to a Conservation Grade Farm and one of the largest Wildflower Meadows in North Norfolk. Green fingered visitors will love the range of flora and fauna – there’s so much variety including orchids, snowdrops and daffodils. Ed thinks the range and quality of facilities at Pensthorpe are excellent! For when people get hungry, the Courtyard Café is a must go. It uses locally-sourced, seasonal produce to create wholesome food, daily specials, delicious snacks and refreshments in a relaxed atmosphere full of character and charm. For people wanting to commemorate their visit, the Gift Shop is brimming full of unique gifts and home wares. Pensthorpe Nature Park has free parking and free admissions to the gift shop and Courtyard Café. Admission to the park includes entry to WildRootz and Hootz House, and costs £10.95 for adults and £9.95 for children. 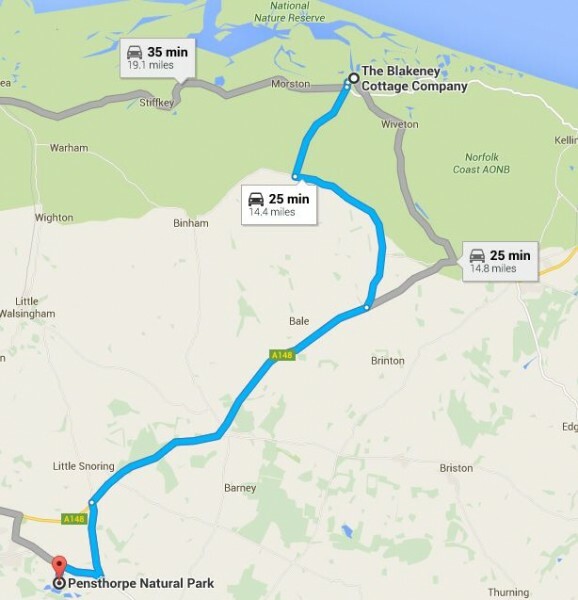 Pensthorpe Natural Park is 25 minute drive from Blakeney Cottage Company HQ in Blakeney.